You can access listen to your voicemail messages from Microsoft Teams apps or phones, Skype for Business apps or phones, or Outlook apps. When you have new voicemail, the Phone tab in the Skype for Business main window displays the number of your messages. Click the Phone tab to see your messages and the caller’s info. Pause on a voicemail picture area, and click the arrow to Play. Start a Video Call with the contact. See Contact Card opens the caller's contact card, which lists their phone number, email address, office location, and so on. Open Item in Outlook provides more information about the call. Delete Item deletes the voicemail from Skype for Business. You can also click View more in Outlook to open the Voicemail folder for more info. Pressing the 1 key will rewind the voicemail message. Pressing the 2 key will pause or resume the voicemail message. Pressing the 3 key will fast forward the voicemail message. Pressing the 4 key will make reading of the voicemail message slower. Pressing the 6 key will make reading of the voicemail message faster. 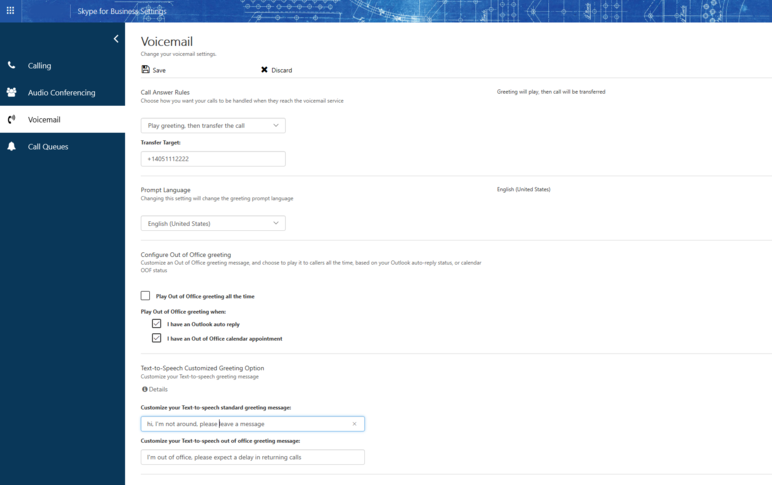 By default beginning April 2017, voicemail transcription is available for all Phone System in Office 365 users. When you receive a voicemail, the message will be transcribed in the body of the voicemail email you receive in your mailbox. If you do not want to have transcription for your messages, ask your admin to disable it for you. For more accessibility options, see Learn how to navigate Skype for Business using accessible features. If the you haven't changed your personal greeting, a default system greeting will be played for callers. For example, "Please leave a message for John Smith. After the tone, please record your message. When you finish recording hang-up or press the pound key for more options." Text to Speech (TTS) will also be used to say your name. Your voicemail is set up with a default greeting, but you can record a personal greeting any time you want. On the Phone tab, click the voicemail icon below the dial pad, and then click Change Greetings. Skype for Business calls your voicemail and guides you to record a personal greeting. When asked to press a number, pause on the phone/mic icon and click a number under the DIAL PAD tab. Follow the prompts to record your greeting. You can ask your admin to change the greeting language for everyone in your organization. Your admin should see this topic for instructions: Change the default language for greetings and emails. From any standard browser, go to https://aka.ms/vmsettings﻿. From the Skype for Business desktop app (if you are running Click-2-Run build C2R 8201.1002 or later), select Set Up Voice Mail. From the voicemail email, click the Set Up Voice Mail hyperlink. On the Skype for Business Settings page, select Voicemail. Change your Call Answering Rules You can change what options your callers have when they reach the voicemail service; get disconnected, hear your greeting, record a message, choose to be transferred to the number or user you select. Change your prompt language This is the prompt language that is played to callers. For list of supported languages, see Languages for voicemail greetings and messages from Skype for Business. A supported email client such as Outlook. Visual voicemail on a Skype for Business desktop phone, Skype for Business app, or the Lync client for Mac. 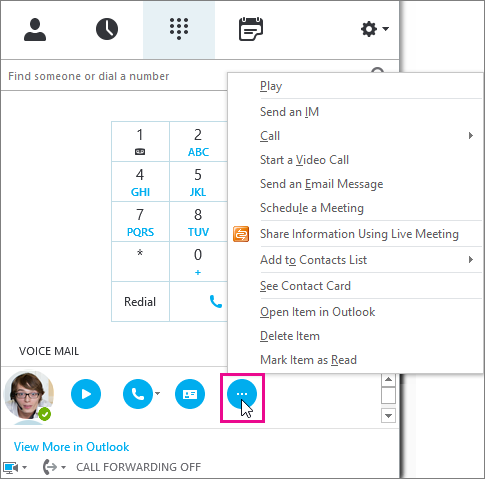 Note: To enable visual voicemail, ask your admin to make sure you are enabled for Exchange Unified Messaging, following instructions in the Configure Skype for Business Cloud Connector Edition guide. When you receive a voicemail, a notification will alert you on Skype for Business apps, desktop phone, and email app. If the caller hangs-up before leaving a message, you will receive a Missed-Call Notification email with the caller information (if it was not blocked). What's it like for callers to leave messages? Depending on the users settings for Call Answering Rules Callers can hear a greeting, record a message (up to 5 minutes), and/or choose to be transferred to the target defined by the user. Visit your User Settings Portal https://aka.ms/vmsettings﻿ to learn more. Repeat menu All of the menu prompts will be repeated for callers so if they don't press a key on their phone before hanging-up, the menu prompt will be repeated three times. Delete or re-record their message. Continue to record their message. Mark the message as high importance.